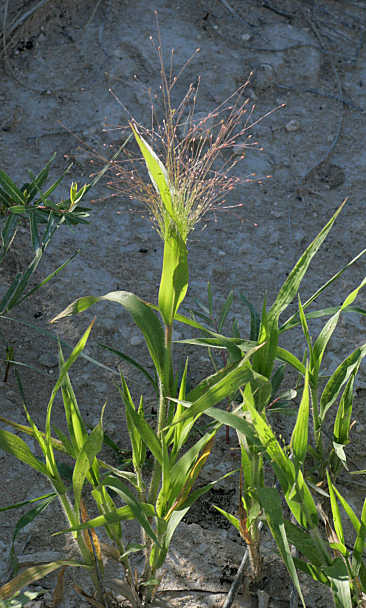 Panicum capillare.Copyright © Kurt Schaefer.Grasses of Texhoma-Goodwell Texas County, Oklahoma.www.opsu.edu. (Accessed 5/2014). Panicum capillare is an annual, C4 grass (Downton 1971), to 70 cm tall, densely tufted, coarse, sheaths rough-hairy, branched from base. Leaves 0.6-1.7 cm wide, bristly-hairy from wart-like bases. Flower spikelets 1-flowered, 0.2-0.3 cm long, tips pointed, mostly on long stalks sometimes self pollinating (Clements et al. 2004); inflorescence large, often purple, diffusely branched, sometimes two thirds height of plant, base of inflorescence often enclosed in leaf sheath; mature inflorescence emerging from sheath, eventually breaking off to become a tumbleweed. Seeds eaten by birds and mammals (Martin et al. 1951); July-Oct. Frequency in NYC: Very infrequent, (although this is a common, weedy grass). Habitat: Dry sandy or rocky, open soil, often an agricultural weed. Can use up to 50 % full sunlight (photosynthetic saturation) but is not shade tolerant. Not a preferred food for insect herbivores but is host to a number of fungi (Clements et al. 2004).